The phrase up to eleven is famous in the right pop culture circles. You know how amps have a volume dial that goes up to ten? These ones go to eleven. What else goes to 11? 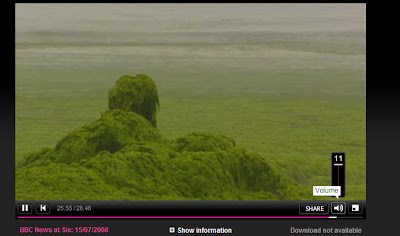 Why, the BBC's iPlayer volume too! Is it weird that i find that so funny? I find this a mild source of amusement too. It's like someone in the iPlayer team wanted to include a little joke in the final version of the excellent iPlayer. Bit like those easter eggs you get from time to time (the ones hidden in software not the chocolate ones).